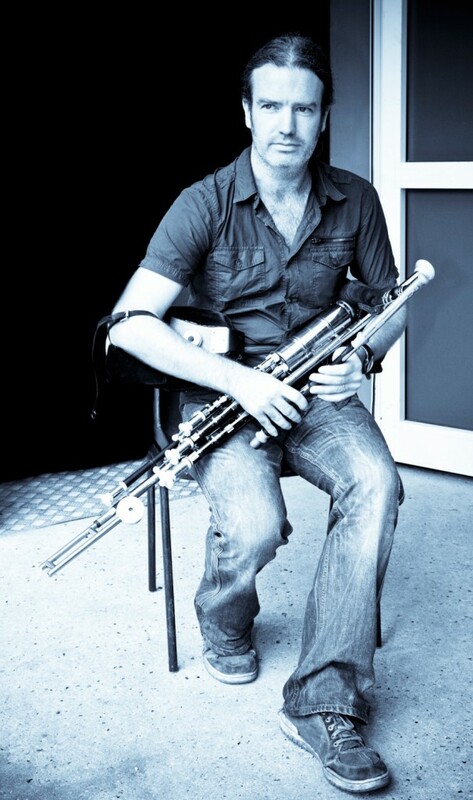 Dirk Mewes is a Colorado uilleann pipe (Irish bagpipes) player and also makes pipes out of his workshop in Berthoud. 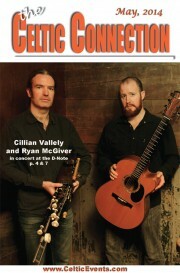 He spoke recently with Cillian Vallely, the uilleann piper with the ever-popular Irish band Lunása. Cillian has also recorded and toured with a diverse collection of artists and shows, including Natalie Merchant, Bruce Springsteen, Mary Chapin-Carpenter, Tim O’Brien, and Riverdance. Cillian will be performing at the D-Note in Arvada May 18, 3pm, and holding workshops with Ryan McGiver, a folk singer and guitarist from upstate New York. Cillian: “I think I started the pipes when I was eight years old. I was playing the whistle for a few years before that. My parents were both teachers of traditional music. They have had the piper’s club in Armagh for almost fifty years now. So they were running a little music school once a week. I used to just bring a whistle to that for a while. I remember my mother trying to teach me the fiddle, and trying various instruments, but my father was a piper and was teaching the pipes. I remember him giving me a practice set to try, and I took to it more than the other instruments. Cillian: “I went to university, and I sort of studied things that I didn’t really care about. In the Irish system, you kind of have to decide what you are going to do when you are about 16, and I just did the degree in economics and business. I realized after about a month of the courses that I absolutely had no interest, but there was no changing or turning back in the system, so I finished it out anyway. Cillian: “I suppose it is directly related to the music, itself, getting more popular. The music has gone from strength to strength, and pipes have gone along. And it’s not just done in isolation, there has been a steady increase in the amount of people playing the music. In terms of more popular culture, that can be changing – you know kind of a fad thing. There was a period in the 1990′s when pipes were getting used in a lot of commercials and movies, and I did a bit of that kind of work myself, but that’s just sort of an almost separate thing. The fact that the pipes were used in “Braveheart”, it’s a very temporary thing. “But in terms of just the sheer number of people playing pipes, that’s been on a steady incline since the late ’60s, when it truly was at an all-time low. The more people play, the better standard the players are. Certainly, you see that with more makers, the standard of instruments is just getting better all the time. With the instruments that are made now, I’d say there has never been an era like it. “I clearly remember teaching 20-25 years ago, and the pipes that would be brought into the class would make you cringe. And now, you go into a class and everybody plays an A, and it seems to be in tune, and people can’t blame the pipes anymore. There’s also a great standard in reed-making. With more people playing, and more people making them, there’s more quality players, and more quality instruments. Cillian: “I met Ryan, I’m not sure exactly when, it was at least five years ago… He’s from upstate New York, and had moved down to New York City, where I am living. I ended up doing a few sets and bar gigs with him. He’s a great player and a great singer, but apart from that, we became good friends, and enjoy each other’s company. So, we ended up doing a festival, and then we kind of turned the festival into a tour. So, Ryan sings, he accompanies the tunes that I do on the whistle and the pipes, – and that would be strictly Irish music. But then, he sings American folk songs. So, we have worked out a show combining the two. And I enjoy it myself. I spend most of the year playing, not just with Lunása, but also with other ensembles of at least three or four other people. Cillian: “In this show I will do a few thing unaccompanied, and use a lot of drones and regulators, and then we do some things with just the chanter and guitar, and there are things that will match the chords of guitar – matching them with the regulators, and we do a bit of that on the songs as well, kind of using all the parts of the pipes, to back up the song. Cillian: “Yeah, with the ‘National Concert Orchestra’. Niall, my brother is a traditional musician, but he has studied music at college, and he’s always played classical music, and he’s done a lot of arranging in the last ten years, for kind of smaller ensembles. I took part in a lot of his projects myself. He had written the music for a BBC documentary on the ‘Flight of the Earls’. It was the 400th anniversary of that. We did a series of concerts for a twelve-piece classical ensemble. And he’s certainly been writing more and more. Then the opportunity came up with the RTE orchestra, and he arranged the music of Lunása for a full orchestra. It was a great thing to do! I played a lot of classical music growing up, and I had played in an orchestra for six or seven years, but I’d never played the pipes with an orchestra. So, I’d sort of enjoyed bringing the two things together, at last. I think it collaborates very well with Irish music. “I think a lot of people are very taken by the ‘Celtic Rock’, but actually, I think that the classical music world is closer to the Irish music world. As long as the classical players stay away from the melody! I say that, kind of joking… The classical players are trained to be able to play anything. But when Irish music is written, it’s not written as played, and classical players play what they read, so if what they read is not written correctly, then what they play sounds. You know you could nearly start laughing sometimes if you hear a violin player play an Irish tune from a book. But, that’s because the music is written in its simplest form. Cillian: “You asked about keeping the music fresh, and doing collaborations. I think one thing is that when you play professionally, you play a lot more, so you get a lot better than you would have been than if you played just once a week. You end up playing four-to-five hours a day, all the time. So, when you do something new in a collaborative project with classical musicians, or whatever, it definitely helps keep the excitement levels up. We’ve done a lot of that stuff! Cillian: “I mean, it’s one of those things if you grow up, you grow up. That’s what it is. You can’t go back and grow up in another household, and compare the difference, you know? It was just part of life. With music school, it was always concerts, and practices, and sessions. My father taught me for the first few years, and then he handed me on to one of his pupils who was maybe only 15 years old, Mark Donnelly, he was a great piper. He taught me for a while, and when I was about that age, I was teaching some of the younger guys. You know, that’s sort of the way the club always worked. The pupils become the teachers, and it’s still going very strong. My younger brother Caoimhin, he’s a fiddle player now and piano player. We all came through that, and we have two younger siblings, Lorcan and Maire, and they all play. Not as much as the three of us, but a lot of it was taken for granted. “I was more into sport, myself. I was a runner and footballer and I probably enjoyed that more as a teenager. But the music was there. I never gave up on it, I still played. I really got back into it when I was probably 18 or 19. The good thing was, I wasn’t a beginner . When I should have got my bug for wanting to play the pipes all day long every day, I wasn’t just starting, you know. I had already been playing for 10 or 11 years. I appreciate that now, but when you’re younger and it’s just there, and it’s your family, you certainly had no sense of feeling lucky or this is great. It’s only with hindsight that you realize that it’s a privileged upbringing of culture, you know? Cillian: “I suppose there’s a limit to what you can do in any workshop. But I would certainly advise people about how they’re executing things. I think one thing, no matter how advanced you are on the pipes – or any instrument, is that you can always improve your sound, and you can always improve your rhythm. Piping can be incredibly technical and incredibly complex if you want it to be, to sound great. And pipes sounding good is not just about having a good reed and a good chanter, that’s only the start of it. Colorado audiences have had the privilege of seeing and hearing Dubliner Glen Hansard many times during his tenure with The Frames that began in 1990; most recently in 2005 when they played at the Bluebird Theater. And after the success of the music from Once, Hansard and his co-star Markéta Irglová have appeared as The Swell Season on stage at the Ogden Theater in 2007 and the Ellie Caulkins Opera House and the Telluride Bluegrass Festival in 2008. The film, written and directed by former Frames bass player John Carney in 2006 with additional input from Hansard and Irglová, made it to the Sundance Film Festival almost by accident in January 2007 where it won the World Cinema Audience award in the Dramatic category and the title song written by Hansard and Irglová won the Oscar for best song in 2007. Hansard wasn’t even Carney’s first choice to play the male lead, known only as “The Busker” and was looking for an older woman to play the female lead, “The Girl”; when Carney’s choice dropped out, he turned to his old friend Hansard who recommended the 19 year-old Irglová, daughter of a Czechoslovakian friend, for the part and the rest is movie, music and theatre history: How three friends armed with a few songs and a bit of a script made a low-budget ($160,000) film that earned over $7 million in its first three months of world-wide release, wins the Oscar for best song, then is turned into a multiple-Tony-award winning musical on Broadway that also wins a Grammy for Best Musical Theatre Album. They ultimately decided to set the show in a Dublin pub and to also include music played by stage characters who weren’t musicians in the film. They retained the songs from the film although in a somewhat different order and occasionally with modified arrangements. Martin Lowe, who did the orchestration for the show, observed that “The songs feel just a little bit bigger than they did in the movie. That’s unusual; it’s the movies that are always bigger. But the most musicians on any number in the movie is five. We’ve got 12 onstage, although they’re not all playing all the time. Often, we have three or four guitars playing at any one time. We also use ukuleles, mandolins, strings, drums, an accordion, and a banjo. The banjo is in quite a lot of the songs because one of the actors wanted to learn it.” And just like a session in your local, there are different people who start and stop the different tunes depending on who is on stage at the moment. To close the musical loop, Hansard and Irglová visited the show while it was in development off-Broadway, made some fine-tuning suggestions and then gave it their blessing. Featuring a multi-talented touring cast that sings, dances and plays their own instruments, Denver theatre-goers will be able to see for themselves that Once deserves the eight Tony awards it received including those for Best Musical, Best Direction of a Musical (John Tiffany), Best Book (Enda Walsh), and Best Orchestrations (Martin Lowe) . Once plays at the Buell Theater in the Denver Performing Arts Complex May 6-18; performance times are Tuesday-Sunday at 7:30 PM and 2 PM on Saturdays and Sundays. Tickets and information at http://www.denvercenter.org/buy-tickets/shows/once/about.aspx or call 303.893.4100, 800.641.1222 or TTY: 303.893.9582. The Bennett School of Irish Dance will fill the stage at the Lone Tree Arts Center with the exciting sounds and color of Irish music and dancing on Saturday, May 10th. Spirit of Ireland 2014 is the latest in the series of shows which have delighted audiences every year with traditional steps and modern choreographies in the Irish tradition. This year marks the 20th anniversary of Riverdance, the phenomenon which brought Irish dancing from church halls and country pubs to Broadway. What better way to celebrate that revolution in world entertainment than by enjoying Spirit 2014? The Lone Tree Arts Center at 10075 Commons Street will provide a luxurious setting in keeping with the quality of Spirit 2014. More than 100 Bennett School dancers will showcase the audience-pleasing skills they hone in more than 80 performances per year, including the Cheyenne Celtic Musical Arts Festival, Elizabeth Celtic Festival, Colorado Scottish Festival, Long’s Peak Scottish/Irish Highland Festival and Summerset Festival. The roots of Irish dancing reach back thousands of years, but the dancing has always thrived on innovation as dancers devise new steps and routines to fit traditional tunes, and fit traditional steps to new music. Spirit 2014 will draw on both strains to present colorful costumes and skillful steps in an ever-changing variety for an exciting evening’s entertainment. The Granias in Concert: Colorado’s Own Celtic Women! The Granias. inspired by their namesake, the famous 16th century Irish Pirate Queen Grania, these Celtic women bring their graceful, swashbuckling sound to Denver’s Swallow Hill stage on May 10. Expect traditional fiddle tunes “powered by pure energy” (Boston Music Spotlight), “exceptional” vocals (Irish Music Magazine) and “beautiful” harp, (The Folk Harp Journal), driving guitar and rhythmic Irish bodhran drum. Fiddler Jessie Burns recorded three number one World Music albums while touring with Celtic supergroup Gaelic Storm. Sirotniak is known for her rich, session-style playing and unparalleled community spirit that earned her a place in the Longmont Times-Call’s Top 100. Gadbaw and Krimmel’s latest duo release was described by Colorado Public Radio as “stunning,” and by British folk magazine What’s Afoot as “an absolute joy to listen to.” With a varied repertoire of ancient melodies on the celtic harp, rollicking fiddle tunes, Irish traditional ballads and sing-alongs, The Granias are sure to steal your heart. In addition to Burns on fiddle -Beth Gadbaw (vocals/drum), Annie Sirotniak (guitar) and Boulder harpist Margot Krimmel comprise traditional Celtic folk group. Saturday May10 at 8 p.m.
Angus Mohr shares their time and lends their talent to help raise money for ten-year-old Max Watson, the first of fourteen patients identified with a newly discovered metabolic disorder Cobalamin X. From birth, Max has faced developmental challenges including an inability to walk or stand. Because his condition compromises his immune system, Max attends fourth grade via a remote classroom. His family cares for him in their home, moving Max many times each day to ensure that his life is as rich and full as possible. They play a benefit show for Give Max a Lift, from 2 – 6 PM on the 31st at Defy! CrossFit, 6850 W. 116th Ave, Unit A, in Broomfield. In other Angus Mohr news, longtime lead guitar player Mark “Byrd” Tester has retired and been replaced by Michael Aggson, former front man for the blues band Third Degree. Avourneen is in the big room at Katie Mullen’s downtown on the east end of the 16th St. Mall from 9 PM – 12 AM on the 2nd, 9th, 16th, 23rd & 30th, at Lannie’s Clocktower on the other end of the Mall at 11 PM on the 10th, 17th, 24th and 31st and at Stella’s Coffee Haus on S. Pearl St., Denver at 7 PM on the 3rd. Kevin Dooley and his trio play on the 8th for Larry’s Guitar Shop Listening Room Series in Longmont, 7:30 PM, tix are $5, then play at Haystack Mtn Golf Course, Niwot, for their Wednesday night music series on the 14th from 5 -8 PM and are at The Gold Hill Inn from 5 -7 PM on the 18th. Skean Dubh plays for the Ridgegate Community Evening Concert in Highlands Ranch from 4-5:30 PM on the 9th and for the Beltania May Pole Ceremony in Florence, CO at 10:30 AM with a concert at 1 PM on the 10th. The commoners are on the stage of the Crown Bar in Cheyenne, WY at 9:30 PM on the 10th and then play at Ned Kelly’s in Littleton at 9 PM on the 17th. 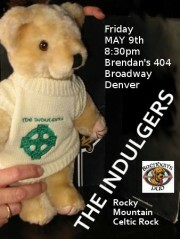 The Indulgers hit the road for performances at the legendary Dubliner pub in Omaha, NE on the 2nd and 3rd at 9:30 PM then return home to play at Brendan’s 404 in Denver on the 9th at 8:30 PM, The Exchange Tavern, Westminster at 8:30 PM on the 10th, at noon on the 17th in Thornton for Thorntonfest and then close out the month at Conor O’Neill’s in Boulder at 10 PM on the 23rd. Gobs O’Phun is at the Celtic House Pub in Parker, 16522 Keystone Blvd on the 24th. You can check out Adam Agee and Jon Sousa at the Denver Public Library at 2 PM on the 3rd when they play there for the Fresh City Life series. Later that day, you can hear Jon perform with fiddler Andy Reiner at the Fort Collins Contra Dance at 7 PM. Pandora Celtica plays in concert with touring guest artist Celia on the 7th, location TBD and then are in the Florence Mountain Park for the Beltania Pagan Music Festival on the 10th at 3:30 PM. Brian Clancy sings and plays at Jack Quinn’s, Colorado Springs at 7:30 PM on the 1st, 8th, 15th, 22nd and 29th, and at the Irish Snug, Capitol Hill at 8:30 PM on the 3rd, 10th, 17th, 24th and 31st. You can hear Big Paddy at the Exchange Tavern in Westminster on the 2nd at 8:30 PM. The always busy Potcheen performs at Brendans at 7 PM on the 2nd, has a CD release party on the 10th at 7 PM in the Larimer Lounge, plays the DTC Tilted Kilt at 8 PM on the 16th, travels to Colorado Springs for a gig at Jack Quinn’s on the 17th at 8 PM and is at the Celtic House in Parker for a 9 PM show on the 24th. Mathew Gurnsey of the Muses performs at the Burns Pub in Broomfield every Thursday this month. Happy Hour is 4-6, Mathew on at 6:30PM – No cover charge.